Characterized by high ceilings and elegant, eclectic interiors, each charming suite incorporates a spacious and luxurious sleeping area adjoined by a private bathroom, a cosy sitting room, and a well-equipped modern pantry with a fridge, kettle and microwave. 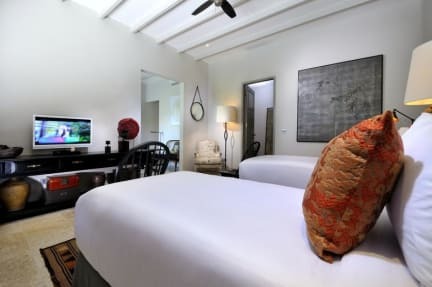 The downstairs suites have direct access to pool and garden, while glass doors in each of the upstairs sitting rooms open to private balconies, each furnished with a table and chair overlooking the rooftops, pool and garden. 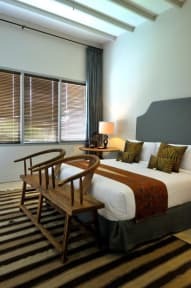 Three of the suites (two upstairs and one downstairs) are furnished with king-size beds and one (located on the ground floor) with twin beds that can be converted to a king.